Who doesn’t adore wacky and obscure Japanese games? The psychedelic nature of LSD, the grappling hook action of Umihara Kawase, the primitive yet innovative 3D of Game Boy title X – there’s something about these trope-defying titles that I find positively enthralling. Thanks to the rise of emulation, region-free consoles, and niche publishers, it’s become easier than ever before to play these games, yet when I stumble across a new one I still find myself just as excited as ever. Ace of Seafood is the latest bizarre title from the Land of the Rising Sun to grab my attention, and it might just be the greatest. 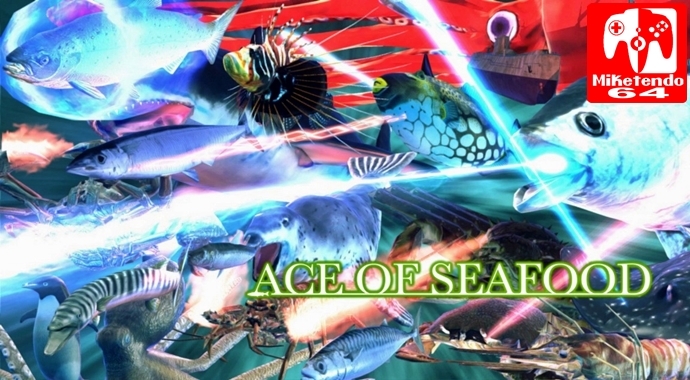 In Ace of Seafood, you play as a fish… that shoots lasers. I’m pretty sure I already sold 90% of the audience with that last sentence, but let me explain further, for the curmudgeons among you. Your fish has up to 4 attacks, ranging from simple plankton pistols to homing scales to epic beam cannons, as well as a melee attack that can double as a useful dash. Your goal is simple: destroy all who oppose you, and capture every reef in the sea to become the titular Ace of Seafood. Of course, you can’t do it alone, and that’s where the multitude of other creatures come into play. Perhaps saying that you play as a fish wasn’t quite accurate – you can play as a fish, or a crab, or a shrimp… or a BATTLESHIP. While there are “only” 30+ creatures to play as, the variety between them is impressive. The starting bunch of crustaceans and small fish feels a bit samey, but your posse will quickly expand to include penguins, octopi, sharks, and even submarines. You can take 5 extra animals to fight alongside you in battle, and they all have their specific uses – any frustration you have with sudden difficulty spikes can usually be attributed to a stale squad, as switching up your tactics is critical. After you’ve chosen your teammates, it’s off to the battlefield to claim what’s rightfully yours. Though the vast seas may initially seem empty and easy to get lost in, a simple click of the left joystick will always set you on a course to the closest reef. Upon reaching one, you’ll be thrust into a battle with the local wildlife for dominance. It would have been easy for the developers to mess up this crucial aspect with sloppy combat, but luckily Ace of Seafood‘s projectile-based battles manage that perfect balance of being silly, cinematic, and skill-based all at the same time. Lock-on will help you keep an eye on your target, but it’s careful aiming and management of your team’s positioning (different formations can be selected with the face buttons) that will lead you to victory. It’s not unusual to be decimated by one of these gangs on your first attempt, but being blown up by a warship’s torpedoes or skewered by a crab’s energy sword is as hilarious as it is exciting. The bitter taste of defeat is always tempered by the knowledge that their powers will soon be yours to command once you manage to best them, as killing an enemy will grant you genes for that species. Get enough genes (as well as EXP gained from any sort of combat) and you can breed said creature for your own purposes, as well as level them up to increase their stats and even unlock new attacks for certain fish. And that’s the game. It’s pretty simple, all told – you go to a reef, wreck everything in sight, enter the reef to save and buff your squad, then do it all over again. Once you’ve seen the credits roll (which can be done extremely quickly, if you know what to do) the game even adds an additional element where roving bands of increasingly difficult enemies will attempt to take back reefs, which gives it some extra longevity. There’s something very satisfying about a grindy experience like this, but there’s also enough surprises to always keep you on your toes. From the nonsensical text in the loading screens, to the names that enemy squadrons give themselves (whoever came up with “Ghost in the shellfish” deserves a raise), to the option to give your octopus a completely pointless alternate skin that dons them in a cutesy rainbow color – you really never know what you’re going to see next. I haven’t even mentioned the multiplayer aspects yet. While you can comfortably play the entire game solo, you can have a buddy join you for some local split-screen, and it’s just as fun to coordinate your attacks and explore the oceans together as you’d expect. If you don’t have anyone nearby, there’s even 4-player online play that makes it easy for other players to join in and leave any time they want without needing to wait around in any pesky lobbies. Considering how much of a focus there is on honing your squad’s abilities, it would have been amazing to also include a Vs. option alongside the co-op feature, but given that Ace of Seafood‘s PC-exclusive predecessor Neo Aquarium: The King of Crustaceans was all about competitive combat I can’t complain too much that the devs decided to focus exclusively on team-based play this time around. I’d love to heap lavish praise on every aspect of Ace of Seafood, but I have to admit that the game is graphically not so hot. While the cheap visuals can be excused thanks to the game’s ambitious indie nature and obvious low budget, the framerate rarely (if ever) manages to hit 30 FPS and will just plain give up during some of the more ridiculous battles when enormous quantities of lasers are flying every which way. It’s all very amusing in an Earth Defense Force sort of way, but I’m sure it’ll still be a deal breaker for some folks. Thankfully the soundtrack is a definite crowd pleaser, with the entire affair being set to a bustling techno soundtrack that sounds like it wouldn’t feel out of place in Ridge Racer with how shockingly high quality it is. It shouldn’t work yet somehow manages to feel right at home alongside all the wacky futuristic weirdness going on. Games like this that offer such an offbeat, original, and uniquely Japanese idea don’t come around often, and when they’re executed this spectacularly it requires recognition. Ace of Seafood might not be the most polished title around, but make no mistake – this is one hidden gem that deserves the spotlight.